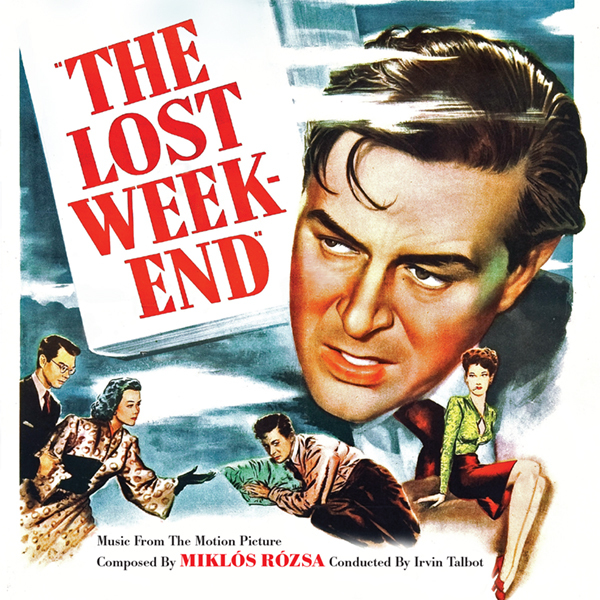 In the 1945 Paramount film The Lost Weekend, composer Miklos Rózsa continued to build on what would become his famous film noir style -- and he had just introduced it in Double Indemnity the previous year. Throughout the remainder of the decade it would become a signature style both for him and the genre in general. It was a style steeped in dissonance, yearning and dark orchestral colors. For Weekend, Rózsa's melodies, harmonies, rhythms and orchestration suffuse the film with qualities of restlessness, yearning and struggle. Without this score, the film would have struggled to portray the seriousness of alcoholism and its destructive wake. The main theme is a piercing siren call, often reinforced by the eerie, wailing timbre of the Theremin, representing main character Don Birnam’s overpowering addiction to alcohol. Another theme represents the faithful, loving and stabilizing presence of Helen as she struggles to hold onto and help Don. These are just examples of artistry found in this Oscar-nominated score. Paramount transferred The Lost Weekend’s original optical music tracks to 35-millimeter magnetic tape long ago. However, it was only recently that archivists located these master tapes. Almost everything had been preserved, but age had taken its toll, and four cues were missing altogether. Nonetheless, this classic score is now represented for the first time as definitively as possible. The film portrays a first in film -- a stark view into the downward spiral of alcoholism and a front row seat to the impact of hitting bottom. The film was nominated for seven Oscars, and took home four: Best Picture, Best Actor for Ray Milland, Best Director and Best Screenplay.